Curly skin weft hair extensions (aka tape in hair extensions) are not as prevalent as straight and wavy tape in hair extensions. The fact is they do make an appearance but you'll miss them if you blink. Curly Skin Weft Hair Extensions... Will They Blend? As there are so many variations of curl patterns in the world of hair extensions, it's hard to say exactly which natural curl pattern would blend seamlessly with curly tape in hair extensions. Curl patterns are created with the use of (perming) rods and as different manufacturers use different sized rods, it means that there are different sized curls on the market. This means that you (the faithful wearer) have to choose whether you think you can make your natural curly hair blend with the curly tape in hair... by curling, wanding, barrelling or any other means. All of this goes to say that when buying skin weft extensions online check the listing description and images as not all retailers allow hair extensions to be returned. Curly tape in hair is available in lengths ranging from 8-26 inches. Longer lengths are available you might have to treat finding them like a treasure hunt... look for the clues and don't give up, you'll eventually find them. 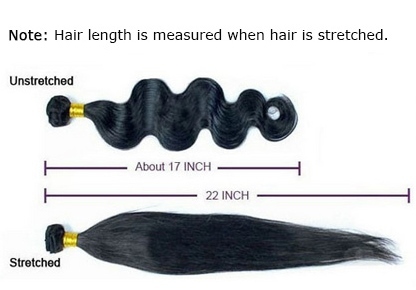 When choosing the length of curly tape in hair (or any other type of extended hair), remember that the length quoted is the length of the hair when straight (stretched) - there's a measurement guide that shows this this. It's always easier to choose the length according to the final cut and style of your new tresses and if you're unsure about which hair lengths complement which face shapes, then check out our wigs by face shape guide - yes it says wigs but it's more about hair lengths and face shapes. 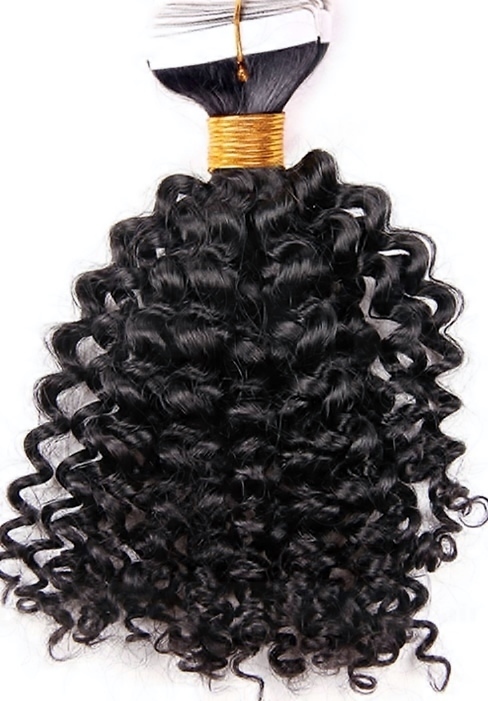 Curly skin weft extensions come in sets of 20 or 40 pieces. We know there are a few retailers offering sets with different numbers, but not enough to write home about. Each multi-piece set is a single length - no multi-length sets available, but that isn't to say it won't change. The most prevalent colours are darker from black to medium browns, but don't worry; the majority of hair extensions can be dyed (although this frequently means lifting the colour first to ultimately achieve colours like blondes and coppers). If you're unsure which colours would complement your skin tone, why not check out our guide to hair extension colours and skin tones. You can peruse Peruke’s guide to Caring for Tape In Hair for an overview of daily styling, combs and brushes for skin weft hair and use the following five top tips to get started. 1. As the hair has been chemically treated to achieve texture, it's better limit the use of heat straighteners as frequent use can sometimes damage the wave pattern and the hair. 2. Use a shampoo for chemically treated hair when you wash your tape in hair and either deep condition or use a leave-in conditioner to repair and strengthen the hair. 3. Smooth dry hair by applying nourishing hair oil to damp hair. 4. Moisturise regularly with a mineral oil free moisturizer to keep the hair hydrated and prevent it from becoming dry. 5. It's best to use a dry shampoo and avoid getting any hair extension products anywhere near the adhesive as it can cause the glue to disintegrate and possibly mat with your growth hair. That's the whole kit and caboodle for curly skin weft hair extensions. You can find more information about skin weft extensions using the navigation menu and there are more answers to questions about hair extensions of all kinds at our hair at our Hair Extension Q&A section or you can join our blog.